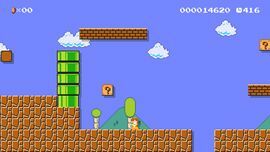 Adventure in Sarasaland is an Event Course in Super Mario Maker, made by Nintendo on January 14, 2016. This course is attributed to the game Super Mario Land, which is set in Sarasaland. Completing this course unlocks the Mystery Mushroom costume for Princess Daisy. This course starts out with the beginning of World 1-1 from the original Super Mario Bros.. In the middle of the course is an underwater route that leads to a remade section of World 1-1 from Super Mario Land. Start in the land of Super Mario Bros. and cross the water into the land of... Super Mario Land! That's the idea behind this course. Transform into Princess Daisy and explore Sarasaland!